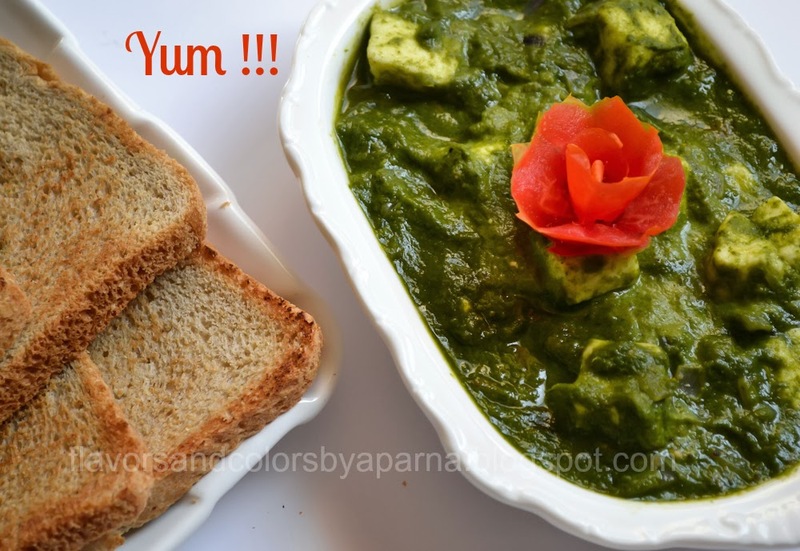 Palak paneer is a popular North Indian vegetarian dish that consists of paneer [cottage cheese] cooked in spinach puree and mildly flavored with Indian spices. I am sure, those who love Indian foods and have visited North Indian restaurants or Dhabas [the road side Punjabi dhabas are known to specialize in its preparation] have probably not missed their chance to taste it. This dish is rich in protein, calcium and iron. 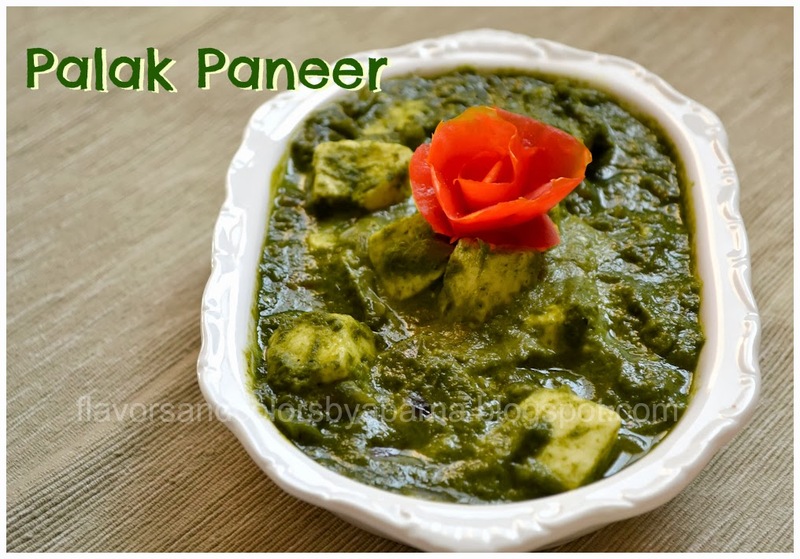 The super color contrasts of green spinach with white paneer makes it look tempting. Traditionally, this dish is served as an accompaniment to rotis, naan, pulao or plain steamed rice and the combination tastes delicious. Bring the frozen paneer cubes to room temperature. Wash, rinse spinach in running water. Remove the thick portion of the stem. [You can follow any method to clean it but make sure to clean it well from all dirt]. Roughly chop the leaves. Blanch it in hot water with sugar. Now drain and put the leaves in a bowl containing ice cold water [ adding sugar and ice cold water helps to retain the green color]. Collect the drained water* in separate bowl, add paneer cubes and keep it covered. This will soften the cubes. 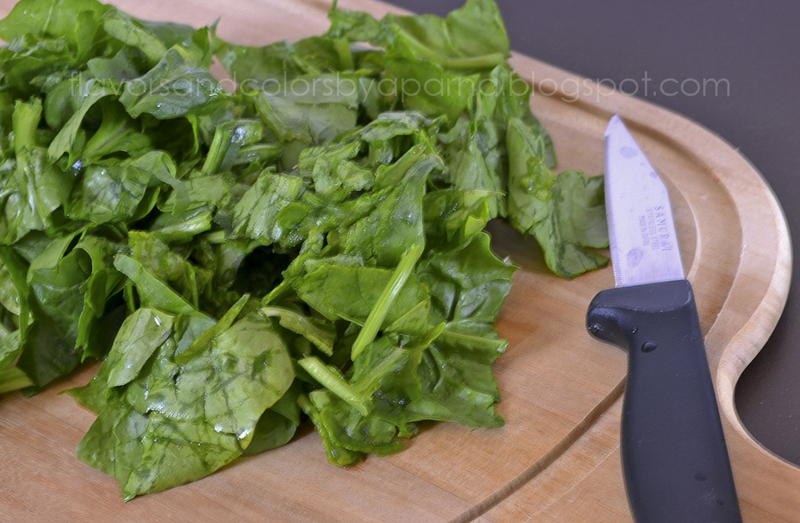 Blend the blanched palak with finely chopped green chilies to a smooth puree. Heat oil in a deep pan. Add dalchini, stir it for few seconds. Add finely chopped onion, grated ginger garlic and saute it till the raw smell goes and onion turns golden brown. Add coriander powder, cumin powder and pinch of turmeric and saute it again on low flame for few seconds taking care not to burn it. Add finely chopped tomatoes, salt and cook till they become soft. Crush the kasuri methi between your palms and add it to the pan. Once soft, add the spinach puree, little amount of drained water * [to adjust the consistency of gravy], cream and allow it to cook on low flame. Squeeze the paneer cubes, add it to the pan and gently mix it. You can crumble few pieces of paneer before adding it to gravy. Simmer it for a minute. Sprinkle some garam masala, squeeze some fresh lemon juice and mix it. Switch off the flame and transfer it to serving bowl. Serve hot with rotis or rice. Note: You can shallow fry paneer cubes on a flat griddle before adding it to the gravy. You can subsitute paneer with potato cubes or tofu. My favourite paneer ish, looks super!